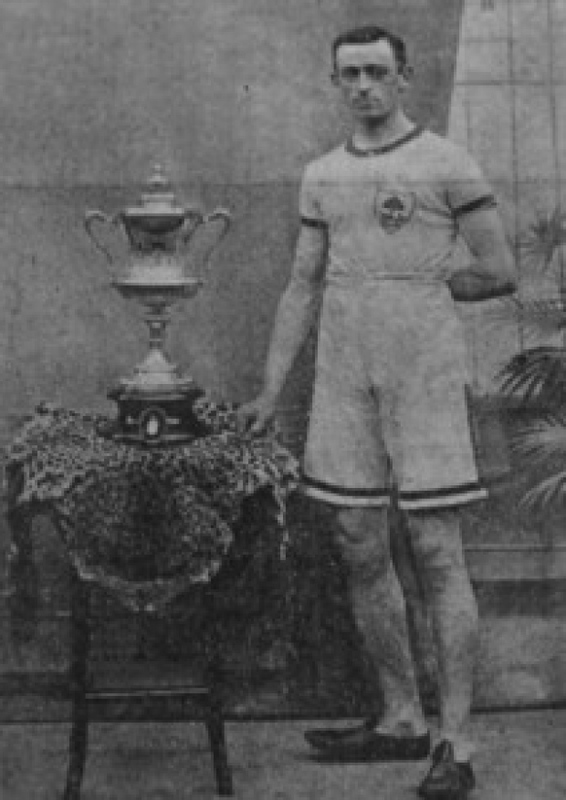 James Curran was an athlete from the Scottish Borders who emigrated from Galashiels in 1910 and only two years later trained the 1912 Olympic 800 metres in Stockholm, Ted Meredith. Meredith not only won but broke the world record in the Stockholm Olympic final. Curran went on to become a legendary coach in the US, training several Olympians over 50 years. Curran is acknowledged as one of the top track and field coaches in US athletics history. Originally Jimmy Curran had been a member of Gala Harriers – indeed he was captain of the club – and ran well in half-mile and mile races. 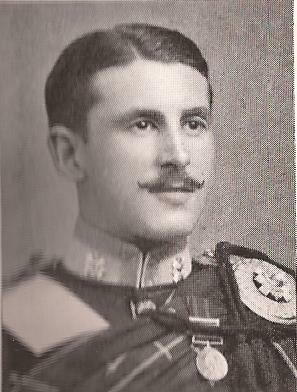 Living in the Borders where there was always a thriving pro scene, he knew he was good enough to make some money as a professional and left the amateur ranks in 1905 to run in the Hawick Common Riding Sports. Like many professionals did, even well into the twentieth century, he ran under a pseudonym – in his case ‘G Gordon’. He did well and at New Year, 1907 running in the half-mile at the Royal Gymnasium Grounds he won from a mark of 15 yards and returned in the three following years. In 1907 he went to America for a short spell but came back to race in Britain again. He also won the Powderhall 300 metres Sprint in 1910 before emigrating permanently to the United States later that year at the age of 30 to become coach at Mercersburg University. His biggest contribution to Scottish athletics, however, was probably through his work with Wyndham Halswell. William Reid was an athletics journalist under the title of Diogenes at the start of the 20th century, and in “Fifty Years of Athletics” (1933) commented that “A short while ago I got a letter from Jimmy Curran, a Galashiels man, who has for almost a quarter of a century been one of the most distinguished athletic coaches in American school and college athletics. He went on to say that Curran found Halswell and gave an outline of the relationship. As we will note later, Curran was a great letter writer. Given Curran’s approach to both the practicalities and the theories of human performance, it is little wonder that he wanted to apply his knowledge and experience to the gifted Halswell, but this team of amateur and professional was bound to lead to tensions. Halswell would hear those views and he didn’t always agree with them or the philosophy they carried, but one thing he was sure of was that his visits to the track could teach him much. Curran taught him the secrets of the punchball for speed, of distance work for stride length and dumb bells for strength. ‘Keep your body fresh,’ he would advise, sharing that nineteenth century preoccupation with how the human body might react to being pushed to the extreme. Curran realised that once Halswell got in front in a race he was unbeatable but he still had to learn to fight in a tight corner. The old Scots runner was clearly Curran and this appeared in the Glasgow Herald on 10th June that year, just before the Stockholm Olympics, he wrote to the ‘Glasgow Herald’. Whether Curran’s optimism was justified or not can be seen from the fact that USA won gold in 100m, 200m, 400m, 800m, hurdles, 4 x 400m, 3000m team race, long jump and pole vault; silver in 100m, 200m, 800m, 1500m, 10000m, sprint hurdles, long jump, high jump, shot, discus and two in the pole vault; bronze in 100m, 400m, 800m, 1500m, hurdles, high jump, long jump, pole vault, shot, discus and hammer. Note the ‘located in remote, rural Central Pennsylvania’ bit: it is still not uncommon for a coach to lament that there are no good athletes in a particular area, and yet coach Arthur Lydiard produced a squad of world beaters whereever he went from New Zealand, via Europe to Mexico. There are many examples of coaches who continuously produce good class athletes from small areas. Nearer home there are coaches who move around the country and have almost all-star squads in every location. Curran went on in remote Pennsylvania for half a century delivering the goods. * Alan Woodring, Olympic gold (200) in 1920 at Antwerp. “Olympic gold medallist and USA Track & Field Hall of Fame member Charles Moore has donated the gold and silver medals he won at the 1952 Summer Olympic Games to Mercersburg. The medals will be displayed in the school’s renovated Nolde Gymnasium. Moore won the 400m hurdles in the record setting time of 50.8 at the 1952 Summer Games in Helsinki and also ran the third leg of the mile relay for the silver medal winning USA team. He was an NCAA champion in the 220-yard low hurdle and 440 yard dash at Cornell University. He also won four straight AAU titles in 400-meter hurdles from 1949 to 1952. The US Olympic Committee named Moore as one of its 100 Golden Athletes in 1996. An Article on Allen Woodring on the Family Search website says “For his education Woodring attended several prestigious academic institutions including Peddie Institute in Hightstown, NJ, then at local Bethlehem Park, and finally to Mercersburg Academy, graduating in the class of 1918. At Mercersburgh, under the tutelage of coach Jimmy Curran, he began to develop his championship potential as a sprinter on the track team. The track at the college is still, in the twenty first century, called the Jimmy Curran Track and his name still appears college publications, indicative of the fact that he is still highly regarded there, 50 years after his death. I quote from two fairly recent references to him. On 4th April 2016 – note the year – in an article in the “On Track” series in the college publications, there is an interview with coach Nikki Walker who is the current head coach for both girls and boys outdoor track and field teams. Back a bit, in August 2008, the Track and Field News had a poll to find the five greatest USATF Coaches of all-time and among the nominations was Jimmy Curran. He was right there with Tom Tellez, Bill Bowerman, Jumbo Elliott, Brutus Hamilton, Payton Jordan, Mike Murphy and the top men of all time. Nor has he been forgotten back in Scotland: Curran was inducted into the Scottish Borders Sporting Hall of Fame in 2008. In addition, the European Coaches Association is considering awarding Curran a place in its own hall of fame in recognition of a lifetime of achievement in track and field coaching. Curran is possibly the Scottish Borders’ greatest ever Olympic coach and it is said that, despite achieving global success, in a career at Mercersburg Academy that lasted 51 years he never forgot his roots.